Before I get started on the post, I would like to thank Jennifer Baughn, Chief Architectural Historian at the MDAH’s Historic Preservation Division for providing me with the historic sites survey form for the I. Y. Johnson House and for her assistance contacting local preservationists to check on the house’s current status. The buildings I featured in last Friday’s post “A Look at a Few Historic Buildings in Aberdeen” were not the only overlooked buildings I encountered in Aberdeen that piqued my interest. One which I was going to include in that post I found so striking that I decided that it deserved its own post, especially since Friday’s post was so popular. At 108 West Canal Street is a vacant and deteriorating house that stands out due to its uncommon raised cottage form and striking Greek Revival and Eastlake ornamentation. The MDAH HRI and the National Register of Historic Places nomination form which the HRI’s information comes from refer to it as the I. Y. Johnson House (that or the Johnson House is how I will refer to it throughout this post). Although Aberdeen’s antebellum houses generally receive a great deal of attention, there is little information about this house’s history available, though I found some information available on the house’s inhabitants, specifically those with the name I. Y. Johnson. The name I. Y. Johnson appears a couple of times in Aberdeen history. The first Isaac Young Johnson seems to have been a prominent citizen for decades, particularly during and after Reconstruction, and was involved in the end of Reconstruction, the curtailing of African Americans’ civil rights, and the restoration of the Democratic Party to power. He was one of the many prominent Monroe County citizens who in 1875 signed a pledge refusing to hire anyone who voted for the Republican Party in the next election, an act of economic and political terrorism which was looked into in Congressional hearings about Mississippi’s 1875 election, as chronicled in Mississippi in 1875: Report of the Select Committee to Inquire Into the Mississippi Election of 1875, Volume 2, pages 1141-1142. He was a selectman and the secretary of the Aberdeen City Council in 1878. In 1890, he is mentioned as being elected as a Supreme Trustee for the Knights of the Golden Rule, a benevolent society founded in the wake of the 1878 yellow fever epidemic. He was also featured in The Aberdeen Weekly’s November 25, 1904, Special Industrial Edition, which provides some biographical information about him and stated that he was a watchmaker and jeweler who arrived in Aberdeen in 1857, relocating with his brother from Buffalo, New York. In 1904, his business on North Meridian Street was “the oldest mercantile house in Aberdeen that has been in continuous business.” He died in 1911 at either 71 or 72 years of age and is buried in Aberdeen’s Odd Fellows Rest Cemetery. I originally believed that I found nothing to indicate that this I. Y. Johnson lived on West Canal Street, as the only reference to him associated with any house was an Aberdeen Weekly February 28, 1908 mention of I. Y. Johnson purchasing the residence of Mr. P. A. Dulin on Railroad Street for $4,000. It was not until I looked at a Sanborn map that I realized that Railroad and West Canal Streets are one and the same. In 1908, Canal was only called Canal east of Meridian Street; west of Meridian it was Railroad. 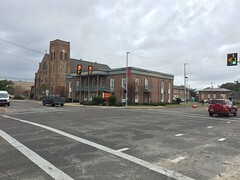 The second I. Y. Johnson – also Isaac Young Johnson – is definitively associated with the I. Y. Johnson House as he is listed as living at 108 West Canal Street on Patent US3214191A, which he was granted in 1963 and 1965 for a Tractor Implement Connection Facilitating Hitch. He was the first Isaac Young Johnson’s grandson. The two of them are buried together, along with many other Johnsons, in a large plot at Odd Fellows Rest Cemetery. He was born in 1901, died in 1980, and was a World War II army veteran. I know nothing more about him nor anything else about the Johnson House’s inhabitants. Besides, though they were prominent Aberdeen citizens, it is not the inhabitants of the I. Y. Johnson House that interested me in this house; it is its architectural significance. The I. Y. Johnson House is unusual as it is an inland Mississippi house with a full-story raised basement, a house form known as a raised cottage (note that I am using the term raised cottage to refer only to a house with a full story beneath the main floor, too many houses to mention were constructed with the main floor raised several feet above ground level but with the area beneath the main floor little more than a lattice-enclosed crawlspace). Before the Civil War, many houses along the Gulf Coast had raised basements, though the size of some of them makes it difficult to refer to them as cottages. The influence of French and Spanish Colonial architectural design from Louisiana caused some to be built in and near Natchez as well. But raised cottages located far inland away from Natchez and the coast have always been rare with attrition claiming most of the few that were built. 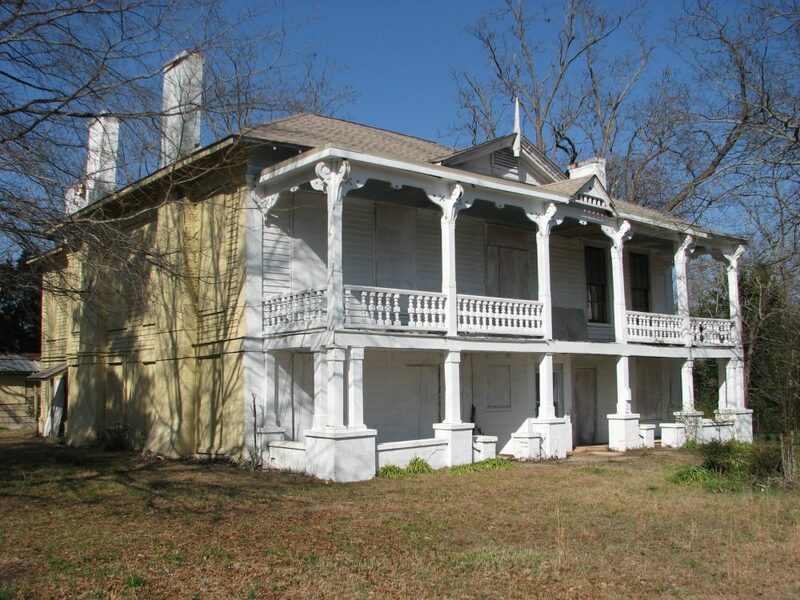 Columbus is the only place in Mississippi’s interior that could be labeled a stronghold for raised cottages and has several surviving examples, the most notable and striking probably being the Pratt Thomas House (Weir-Richards-Thomas House). The raised cottage form died off completely after the Civil War as part of the homogenization of building forms. The main section of the I. Y. Johnson House is almost a square as it is five bays across the front and four, plus two exterior end chimneys, along each side. The rear of the house is overgrown and I did not photograph it, but it has a very old but likely not original two bay by two bay wing plus other additions which may have originally been open porches. The four bay arrangement along the sides lines up from the basement to the main floor, but not the five bay arrangement on the front façade. The main floor of the front façade has a center door, likely lining up to a center hall arrangement on the interior. But the two, probably original six-over-six windows on each side of the door are not equally spaced out and are located closer to the side façades than to the door. The basement façade’s arrangement is equally unusual as it is door-window-center vestibule entrance-window-door, all spaced equidistantly. The center vestibule is especially unusual as it is half-hexagonal with a single door in the middle flanked by small, half-height, multi-paned sidelights on the other sides. The MDAH’s historic sites survey form for the house makes the comment that the only other antebellum house in Mississippi with a similar entrance vestibule is the Amos Deason House in Ellisville, which has a half-octagonal vestibule. Like of the majority of raised cottages, the I. Y. Johnson House has a brick basement and a frame main floor. Although the Johnson House’s basement is brick, it has been stuccoed to resemble ashlar masonry, along with the chimneys. According to what little history is available on the house, as recorded on the historic sites survey form, the basement was originally exposed brick but was stuccoed in 1928, when various alterations were made to the house. If this is the case, it would be a very late example of scored stucco. Other examples that come to my mind, such as Cherokee in Natchez and the near-ruinous Sailer House in Holly Springs, are antebellum. An examination of the stucco for the presence of portland cement would provide more clarification on its application date. Whatever its composition, its age, lack of maintenance, and presence of water has caused it to spall in various places. While the basement, half-hexagonal entrance vestibule notwithstanding, has no real stylistic features, the frame main floor is a different story (no pun intended). 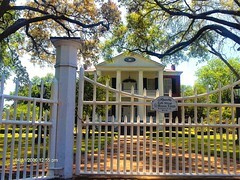 It is a mélange of Greek Revival and Eastlake woodwork. Each corner of the house’s main section has a Greek Revival pilaster with a wide frieze running across each façade below the eaves. These details are mostly seen on the side facades due to alterations to the front façade and additions to the rear. The front façade’s woodwork was changed when the porch was added. The window surrounds are typical “Victorian” woodwork, relatively heavy moldings and bullseye corner blocks. 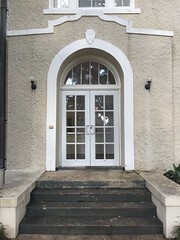 The door surround appears to be a similar, simplified version of the John Ferris Plant House’s front porch window surrounds. The historic sites survey form states that the door is a double-leaf door with a leaded colored glass transom; if those features still exist, they are boarded-up, as are most of the house’s openings. The front porch is where the house’s Victorian Eastlake exuberance is shown. I have no idea what the original porch looked like; its appearance or configuration is not documented anywhere. The current, full-length porch dates, at the latest, to 1890, as it is shown on Aberdeen’s 1890 Sanborn Map, which is consistent with the surviving decorative woodwork. The porch’s main floor is likely unchanged since 1890, but the basement level formerly had full-height square brick columns instead of wooden box columns on stuccoed brick bases. The box columns were installed in 1928, which was also when the porch’s front stairs were removed. As seen in a historic photograph of the house, it had what can only be described as a monumental set of stairs, which included an intermediate landing and led from the main floor down to ground level, possibly to a semicircular brick drive (which could have instead gone under the stairs). The semicircular brick drive is one of the few features of the I. Y. Johnson House’s lot listed in the historic sites survey form. Mature oaks and cedars are also mentioned, all of which gone today, making the yard unrecognizable from its historic appearance as a tree-shaded, picket fence-surrounded place. The brick drive could still exist but if so is covered by a layer of grass. 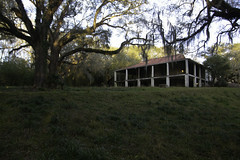 The I. Y. Johnson House retains a large but incomplete lot which comprises nearly forty percent of its block. Many antebellum houses in Aberdeen which originally had large lots had sections parceled off to accommodate infill houses during periods of growth, one of the reasons why Victorian and Craftsman houses are interspersed among those antebellum survivors. This happened to the I. Y. Johnson House, with it sitting on two-thirds of its block in the 1890 and 1894 Sanborn maps. But roughly one-third of its lot was hacked off to build 104 West Canal Street, a small vernacular Victorian cottage renovated a little over a decade ago by Billy Brasfield, and 109 Marshall Street, a hatefully undistinguished and style-less brick ranch box. 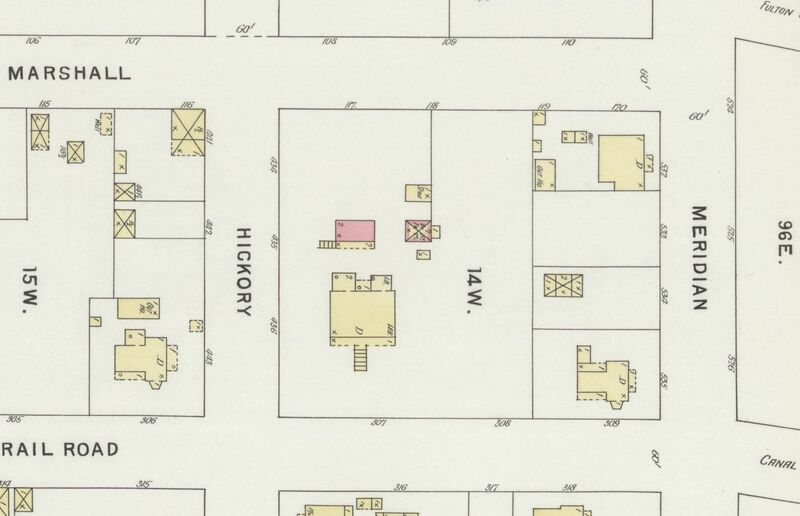 The 1890 and 1894 Sanborn maps show several substantial outbuildings, none of which exist today. One just behind the Johnson House was a two-story brick structure with a full-length two-story porch. While I am not John Michael Vlach or an expert on Southern ancillary structures, I would not doubt that this brick building was a kitchen and former slave quarters. 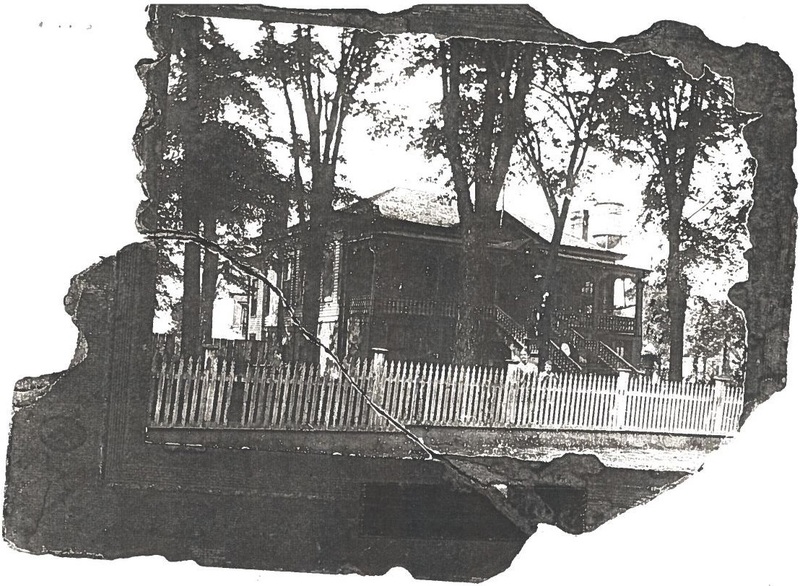 It survived to be photographed, as it is barely visible in the house’s historic photograph, located just behind the house on the left. There is an insubstantial, one-story frame building in the approximate location today. To the side of the conjectured kitchen was another two-story building, smaller and matching the main house’s arrangement of a brick first floor and frame second floor. Its placement slightly farther away from the house would lead me to hypothesize that it was a carriage house. Behind it was a one-story frame building labelled as a shed. Roughly between the carriage house and the main house was another, very small one-story building. Given the era we are talking about here, it was probably the privy, though it could have potentially been a wellhouse. Other details about the I. Y. Johnson House’s architectural history are unknown. It is generally believed to be antebellum, though its construction date is conjectural and its builder unknown. The National Register nomination form gives it a date of c.1855. 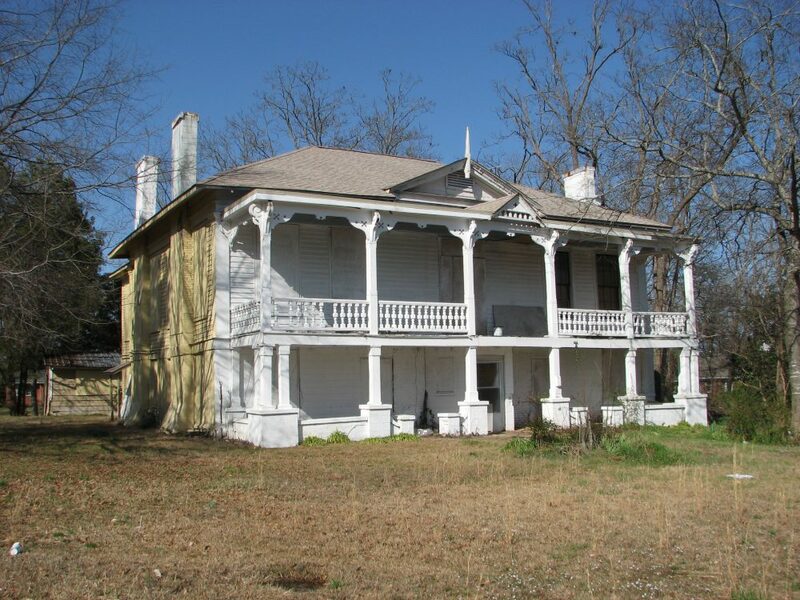 A date of 1838 was provided by the owner when the house was being surveyed for the National Register. Both dates would make sense based upon its initial Greek Revival style, though since Aberdeen was only founded in 1834 and chartered as a town in 1837, the c.1855 date is more likely. Another thing that lends credence to a c.1855 construction date is a detail the Johnson House shares with the neighboring Adams-French House. Both houses have exterior brick chimneys with flared bases. Not every antebellum Aberdeen house has that detail and no other ones have chimneys that flare out as widely, though the Old Homestead comes close. All of Aberdeen’s antebellum houses with that feature have construction dates attached to them between 1848 and 1856. This chimney detail could indicate that one brickmason worked on all of them, and according to Mills Lane in Architecture of the Old South: Mississippi-Alabama there were only nineteen of them in Monroe County in 1850. Unfortunately, none of this leads to a definitive construction date for the Johnson House, just a general idea. While the architect (if there was one) and builder of the Johnson House are similarly unknown, if it shares an architect/builder with the Adams-French House, that again leads to speculation but nothing definitive. The Adams-French House was built for either John Cox or Robert Adams, not by either of them as they were a wealthy planter and wealthy businessman respectively. The Aberdeen Pilgrimage site states that the Adams-French House was built by J. A. Pate and J. B. Taylor the year before they built the Monroe County Courthouse. But the name Thomas J. Davidson is “documented” on the MDAH HRI as the courthouse’s builder, with various courthouse history sites online solving that problem by making Pate and Taylor architects and Davidson the contractor. But, the Johnson House’s builder is undocumented, any attribution to Pate, Taylor, or Davidson on my part would be pure speculation. 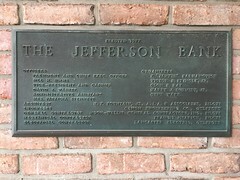 A National Register of Historic Places architectural survey provided much of the paltry amount of information available about the Johnson House, which should be commended. But, if a person needs another example of how listing on the National Register does little to practically protect a historic building from abandonment and neglect, they can look to (among many other buildings) the I. Y. Johnson House, a contributing resource to the North Aberdeen Historic District, listed thirty years ago in 1988. Although my photographs are from 2010, reports are that the intervening years have seen no improvement in the house’s condition. According to Monroe County property records, the house has been owned since 2004 by Blake Davis of Carol Stream, Illinois. One wonders why Mr. Davis covets the house so much that he keeps paying its taxes but not so much that he lets it sit vacant and deteriorating. 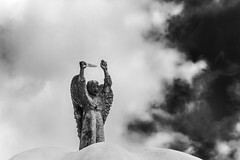 One hypothesis is that it is one of those situations preservationists deal with all-too regularly where some distant relation inherits a historic building that he or she has no interest in and no incentive to do anything with. The Johnson House’s hipped roof is something positive to note about the house. It was in good condition when I photographed the house, even the eaves encircling the chimneys, places where water damage is most likely to occur. The solid roof and the boarding-up of most of the exterior openings will, at least for a while, mothball the Johnson House and keep a vacant and deteriorating house from turning into a vacant and collapsing house. Although much of the I. Y. Johnson House’s history is unknown, what is known is that such an architecturally significant house should not be vacant. 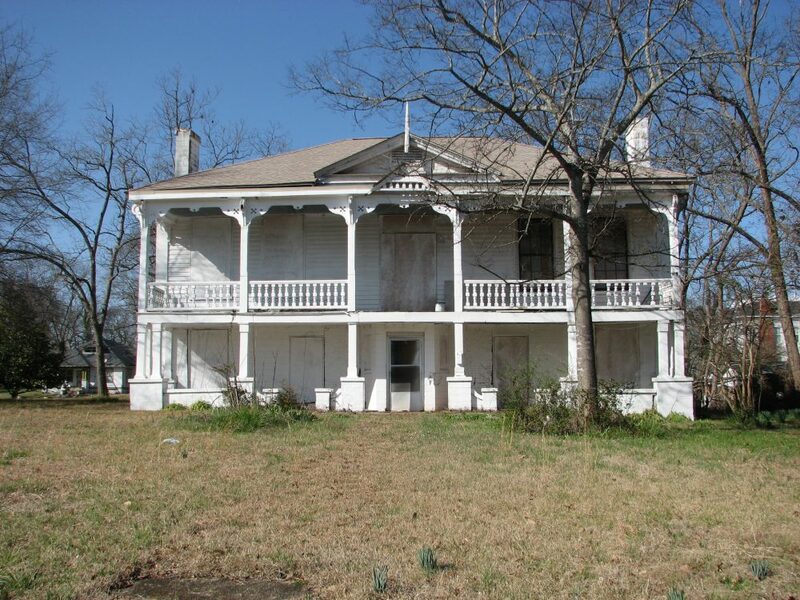 It should receive the highest-quality restoration and take its place among Aberdeen’s landmark antebellum houses. I hope that is the case the next time I am in Aberdeen photographing it. Unless noted, all photographs copyright W. White 2010. All reproduction is prohibited without written permission. Of note is that Captain P. A. Dulin apparently used his $4,000 to upgrade to a brand new house, as his name is associated with a c.1910 house at 208 East Jefferson Street; he was Aberdeen’s Illinois Central Railroad station agent and was also a prominent member of Aberdeen’s First Methodist Church, where he was vice-chairman of the building committee responsible for the congregation 1912 R. H. Hunt-designed sanctuary. Thank you for the background on this unique home in Aberdeen. While living in Aberdeen in the 1980s and early 1990s, I visited the home of “Mrs I Y Johnson,” an elderly lady who did seamstress work. I never knew her given name as she was commonly known in the community as “Mrs I Y.” Now we know the rest of the story. Unfortunately, during my visits to drop off sewing projects, I didn’t get any further than the “basement” and thus cannot add anything to your information about the house. another fine –and, very complete–post, mr white. i hope this house can be saved. A website is not required to comment on the site, just a name and email (which is not shared publicly). Since you put your email in both sections, I changed your comment name to Pat Spriggs. Your comment was in moderation for a short time because you have never commented on this site. That should not be a problem now, so feel free to join the conversation and comment away. So tragic to see a fine old home not being loved and used as intended. Many such homes have been “mothballed” yet that alone doesn’t preserve them or stop the deterioration. A house needs living people there, day in, day out to check for the hundreds of things that can develop. So please, if anyone out there inherits an old home, consider letting it go on to a new life with a new family rather than sentimentially house-hoarding a building that WILL deteriorate. Aberdeen and Monroe County historians do know a bit more about this ante-bellum raised cottage home. It was built for Wyatt Moye c 1855. Wyatt Moye was a partner in the banking firm of Cunningham, Moye & Co. in the 1850s. According to both Eugene Lanier Sykes (1873-1965),historian, banker, planter and businessman; and John Ed Rodobough (d 1980s) famous Monroe County historian. Wyatt Moye married the widow of General Jesse Speight of NC. Speight died in 1847 and his grave is in Odd Fellows Cemetery, AAberdeen, MS. Her name was Louisa and she married Moye in Sept of 1849. She died in Oct, 1856, and is buried in her first husband’s plot in Aberdeen. In 1860 census Moye is living in the house with a new wife, The next owner of the house was Benjamin C. Sims (1845-1910) and his wife Mary Louis Sykes Sims (1847-1923). They are buried in Odd Fellows Rest Cemetery, Aberdeen, MS. Benjamin C. Sims was a descendant of the noted Vassar family of Virginia. B. C. Sims was a merchant in the Town of Aberdeen and a Justice of the Peace for several years. After the deaths of the Sims family the house came into the possession of I. Y. Johnson i n the 20th century. Johnson was a traveling jeweler who saw a need in Aberdeen and settled there. His family were great stewards of the house until the family all died out. That is some great information. I searched for the house’s history and felt lucky that I found as much as I did. Compared to the big antebellum houses in the tourist guides, there was little I could find on the Johnson House. But, I am not an expert on Aberdeen history; I just came across this house and thought it needed to be spotlighted. Thank you for bringing this information to light. Do you have any details on the house’s construction and architectural history that you could share with us?